Millington, Tennessee is a "military town" and is considered low cost. Millington lies 21 miles north of downtown Memphis. NSA Mid-South's mission is to support the global warfighter presence. They believe in integrity, respect, honesty, trust, teamwork, and diversity. They achieve these values by taking care of each other, taking care of the customer and doing the right thing. One of their major commands is the Navy Personnel Command. 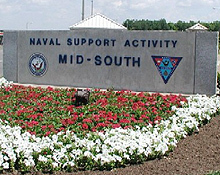 NSA Mid-South has 7,000 enlisted and officer personnel, civilians, and full-time contract personnel.